Incra Measuring/Marking tool does it in Decimal and Metric! A while ago I posted a review on a decimal measuring tape and some of you liked decimals. If you haven’t already HERE is it. Well for those of you that do, I have another product that uses them. It’s the Incra Professional T-Rule. As you can see from he first picture it has the same features as the regular Incra rules except this one has markings for decimal and metric! Now this feature is only included on the “Professional” model. Also it still retains the standard fractional holes down to 1/64”. There are holes every .010” of an inch which is fantastic. Anything more would be useless since that is about the width of a pencil line. Metric also has a hole every .5mm for those outside the USA (even those withing the USA) using metric. It also has markings on the end that you can use to set the height of your cutting tool (see picture). You can get them in 3”, 6”, 12” and 18”, but the decimal/metric version is only available in 6” and 12”. Next is the Marking Rule. Now this doesn’t have the decimal holes for marking, but it is still pretty useful. The thing that sets this apart from everything else it the half slot on the edge. It allows you to mark a line centered on the end of the rule and not past the edge. If you’re not sure what I’m talking about, watch the video and you’ll see what I mean. Like the video shows it makes a great compass. The last one in the set is the Bend Rule. This one doesn’t have the decimal holes either but still has one great feature that you can’t get anywhere else. It has holes at the end on each leg which is great for marking things such dados on the end of a board. I also like being able to mark two adjoining sides at once without getting out the square. 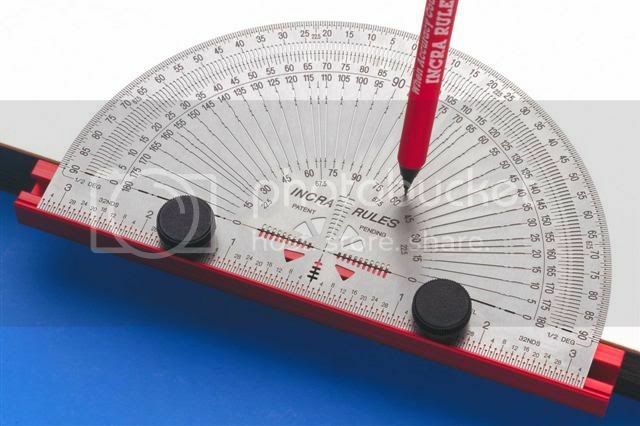 I also have a Incra Marking Protractor. This is a great little tool also. You can see all the features in the little video. One extra thing you get with it is the 6” centering scale. Pretty cool! I have seen another review for the bend rule which mentions that it’s easy to bend. Well it is and it isn’t. These are precision tools and I treat them so. I won’t be leaving around the Bend Rule around waiting to drop something on it. They are very thin, which is what makes them so precise. Anything thicker just wouldn’t work or even come close to the things that these can do. All in all they can do things no other tool can and I plan on keeping them a long time. These things look awesome. Too bad Christmas in over. They are now on my birthday list. ... probably cost an arm & a leg… yes? Not that bad, for example you can get a 6” marking rule on Amazon for $12.99 and a 12” for $15.99. Wow great review, I appreciate the time you took to write about these products. Very interesting, definately something for me to consider. I picked up a 12” T-rule at a garage sale for $10. I love it. Its so simple and inexpensive yet so functional it is a MUST HAVE tool. These look fantastic marking tools to have in the shop – they look really accurate and precise. Thanks for the link to You-Tube – well worth reviewing all the vids in the sequence. As with all things INCRA these are so accurate… not cheap but not really expensive either… altho cost a bit more in the land downunder.. I just need to get the protractor to complete the set.. thanks for the reminder.. and the review. I have yet to see an Incra tool that is not remarkable! however , I have a gripe with their marking rules – they all rely on the use of 0.5 mechanical pencil. in my experience, 0.5 lead is very delicate and especially when used on wood it breaks easily. I never had good success with 0.5 pencils. I use 0.9 mechanical pencils in the shop and they are almost as fine as the 0.5 but sturdy as rock, I have never ever had a lead break on me regardless of what I was doing with it. Thanks Gary, I think these go on my must have list. They expand on the concept of that little General ruler of mine that I picked up a while back at the local hardware store. But these bring the concept to a whole new level. I have been thinking quite a bit about measurement, and the hierarchy of techniques regarding precision and accuracy. These help improve both precision and accuracy in perhaps the least accurate and precise thing we do…..mark with a pencil. even comes with a click pencil too. Been looking for that small metric square. Couldn’t find so Googled and found this outfit. Great personal service. Answered all my questions. Ordered direct from them. Fast delivery. Incremental Tools is the store front for Incra.